Edox introduced three new watches at Baselworld 2012 earlier this month, choosing to build upon its core designs by extending its existing collections. Two models in the Grand Ocean Collection were introduced along with one in the World Rally Championship (WRC) Collection. The first novelty is the versatile Grand Ocean Chronolady from the popular Grand Ocean Collection. The Chronolady is designed for women with a sporting spirit, for whom elegance and a sense of freedom resonate. Like its Grand Ocean counterparts, the Chronolady is inspired by water sports and yacht racing. Distinctive Grand Ocean elements include the planisphere engraved on the caseback and the triple-lug design, which fastens the light, ultra-feminine white rubber strap to the aptly sized 36 mm case. The matching white dial is embossed with a wind rose – yet another detail that speaks to the watch’s seafaring origins. 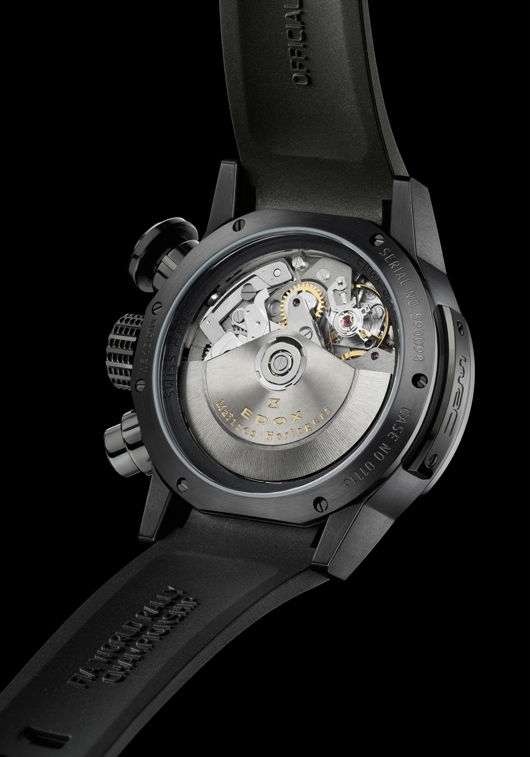 The Chronolady contains a Ronda 5040.B movement for the best in Swiss accuracy and is water resistant to 330 feet. 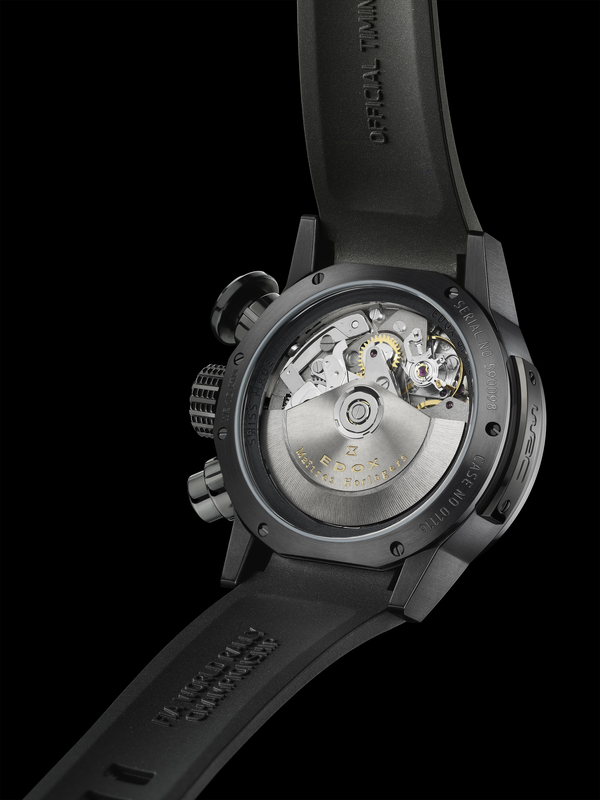 A second addition to the Grand Ocean Collection is the men’s Grand Ocean Chronodiver, a watch that retains the genetic imprints of its predecessors but also introduces something entirely new: a bezel containing both stainless steel and rubber, which not only enhances functionality by improving grip, but also creates a balance in the overall design by uniting the black PVD-coated steel case with the black rubber strap. An ebony-black dial along with silvered indices and hands augments the cohesive modern look. 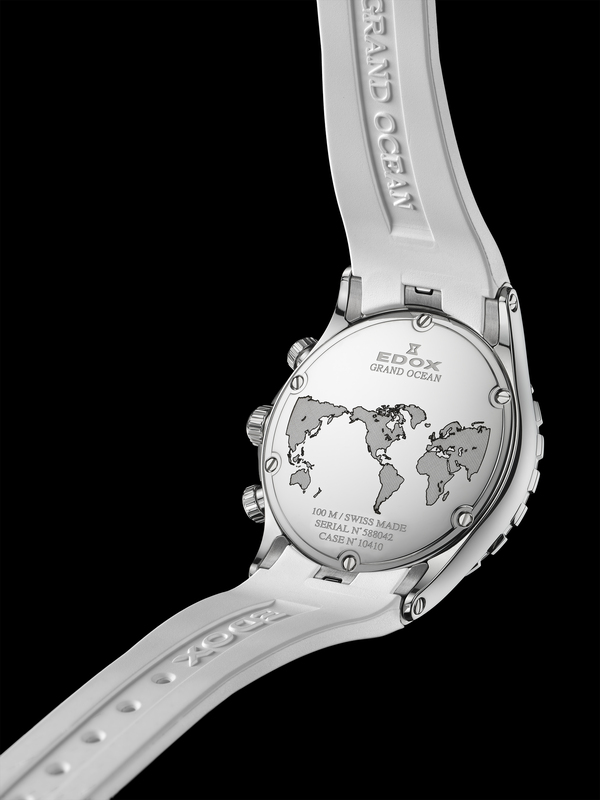 The planisphere on the back of the Chronodiver is different than other Grand Ocean watches in that it provides a view from the North Pole. 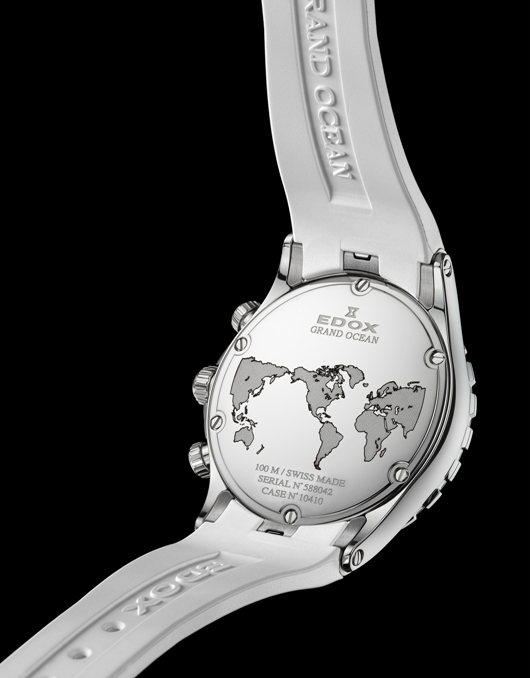 Another notable detail is the outside of the folding clasp, which is in the shape of a porthole with the Edox hourglass logo centered in the middle. The Grand Ocean Chronodiver houses a Ronda 5040.B movement and, naturally, this diver watch offers superior water resistance to the depth of 820 feet. The third new release is the Chronorally Automatic Chronograph, part of the WRC Collection. 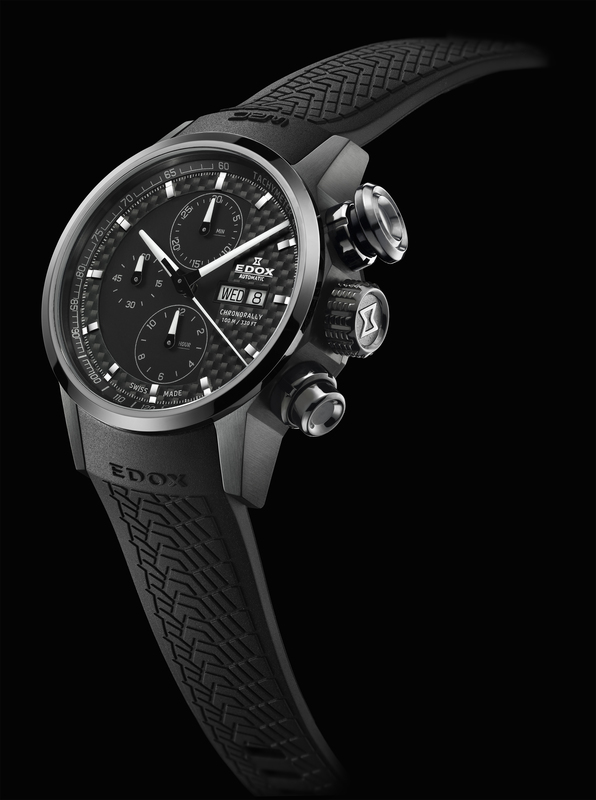 Edox is the official timing sponsor of WRC. Designed for drivers and motor-sports enthusiasts, the Chronorally has all of the features generally associated with the collection such as the profiled rubber strap and oversized aluminum push-button. The dial features carbon fiber and a silvered tachymeter. The Chronorally boasts an unusually large caseback window – nearly 36 mm in diameter – perfect for admiring the famous Valjoux 7750 automatic chronograph watch movement inside. 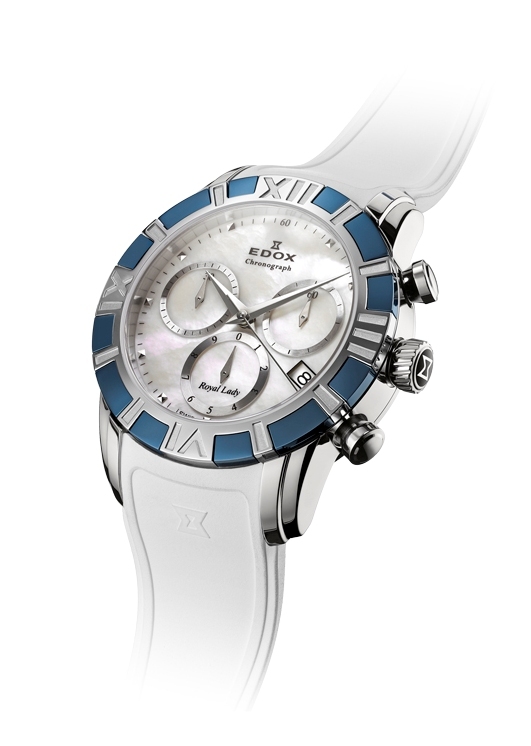 Edox will begin rolling out these new models this summer through authorized Edox retailers. 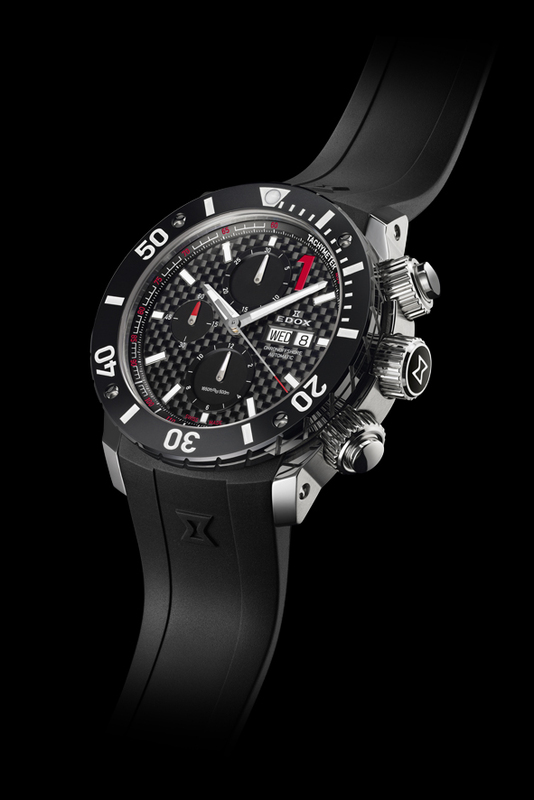 Edox Swiss Watches is the official timekeeper of the FIA World Rally Championship, the Class-1 World Powerboat Championship and the Dakar Rally. The FIA World Rally Championship has an illustrious history. Starting in 1973, this grueling rally series has pitted the world’s best drivers against some of the toughest and most varied conditions on earth. The early years of the World Rally Championship were legendary, culminating in spectacular races like the world famous Monte Carlo Rally. 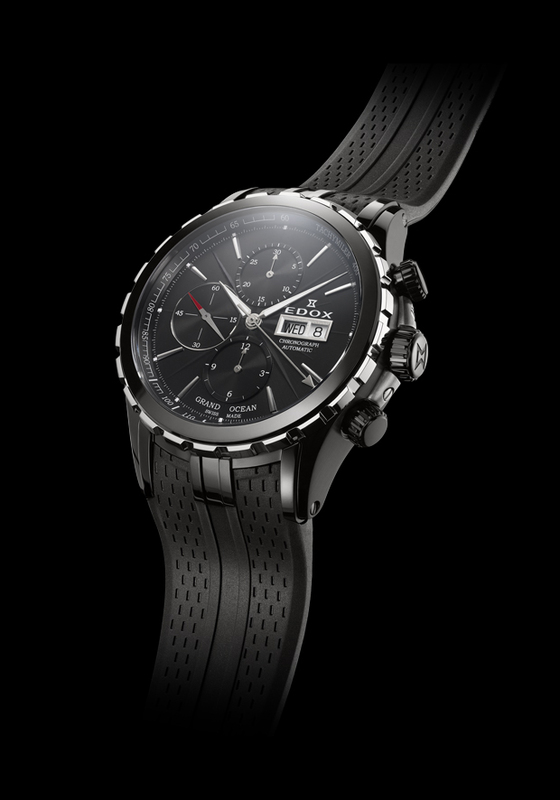 To celebrate a new three and a half year agreement making Edox the official timekeeper of the WRC, Edox is introducing at Baselworld 2012 a remarkable new watch that pays tribute to the legendary drivers of this bygone era. 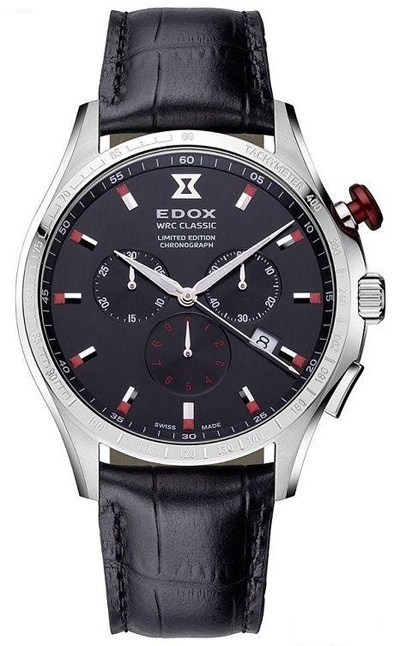 Edox WRC Classic Limited Edition takes you straight back to 1973. 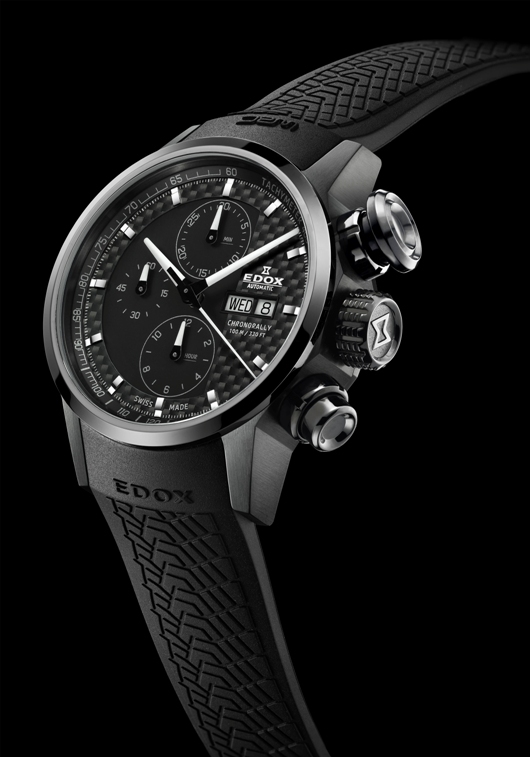 Like the powerful machines that challenged the most brutal driving conditions on the planet during the WRC’s glory days, the Edox WRC Classic Limited Edition is designed to survive virtually anything. This perfectly proportioned 43mm classic features the timeless good looks that defined a generation. A handsome black dial with red-tipped nickel indices provides the perfect backdrop for three well-placed subdials for timing events. Classically shaped dauphine-style hands make this dependable chronograph extremely readable even under the worst driving conditions. 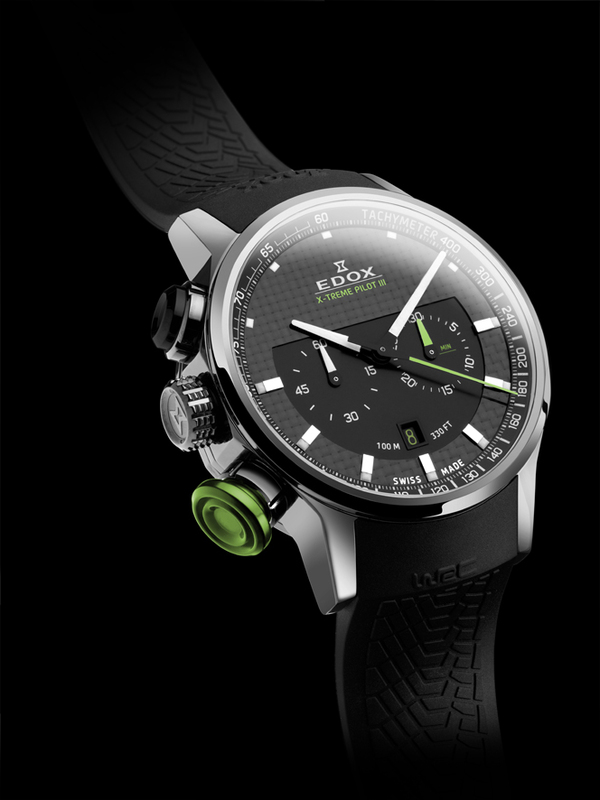 Edox understands that race drivers have enough to worry about without fears of pushing the wrong button. To eliminate unnecessary timing errors, a distinctive red “start” pusher ensures that there will be no mistakes when initiating critical timing events. The “stop” pusher on this durable and practical timepiece is shaped differently as well, for easy recognition even if you’re not looking at the watch. Everything about this spectacular timepiece is designed for one reason: to provide reliable service under extreme conditions. 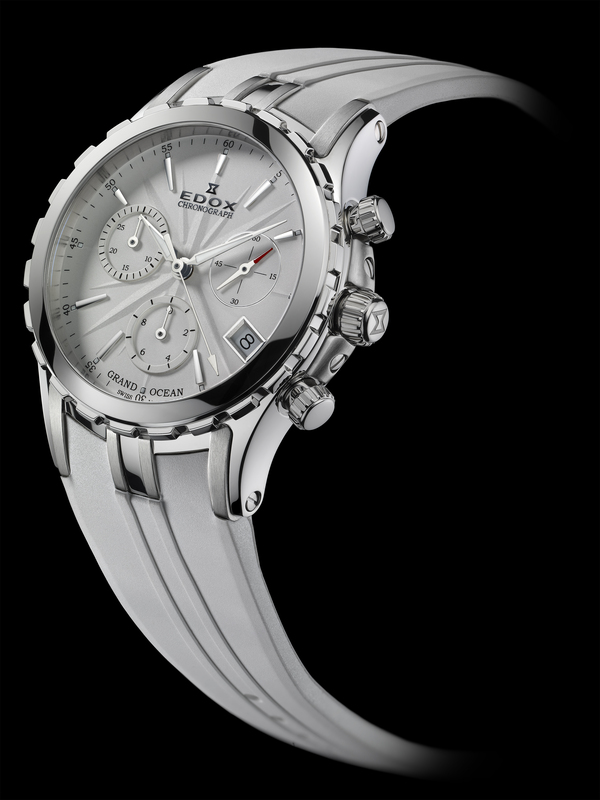 The watch is powered by a proprietary Edox 101 quartz movement, based on the famous and extremely reliable Ronda 5021D. The case is fashioned from the same hardened 316L stainless steel used for precision surgical equipment and aviation components. This race-ready timepiece is water resistant to 150 feet and can be fitted with a matching stainless steel bracelet or a black crocodile strap. 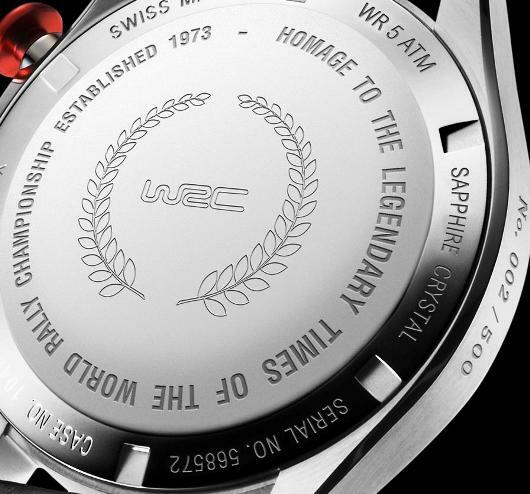 The screw down case back of this remarkable watch is even engraved with the signature laurel wreath awarded to WRC champions. The legendary early days of the World Rally Championship are long gone, but you can still go back to the future with an Edox WRC Classic Limited Edition on your wrist. Start reliving the glory days by contacting your authorized Edox dealer immediately and reserving your WRC Classic Limited Edition timepiece today. You’re invited to visit the Edox exhibit at Baselworld 2012 and to discover the different “grip” of the new Edox Grand Ocean Chronodiver. 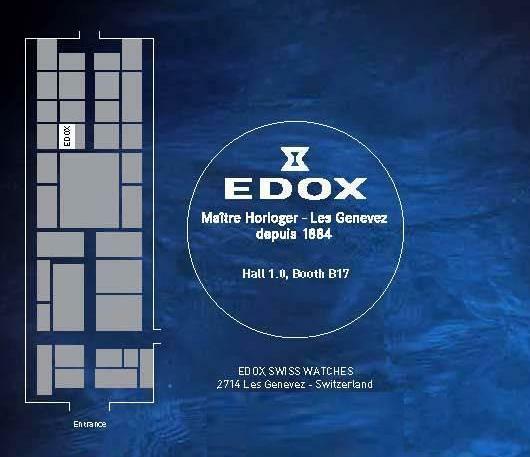 The Baselworld display of Edox Swiss Watches was ideally situated on the principal floor of Hall of Dreams. The Edox booth featured plenty of spacious meeting rooms and a chic retro café boasting great views of the hall situated on the booth’s top floor. 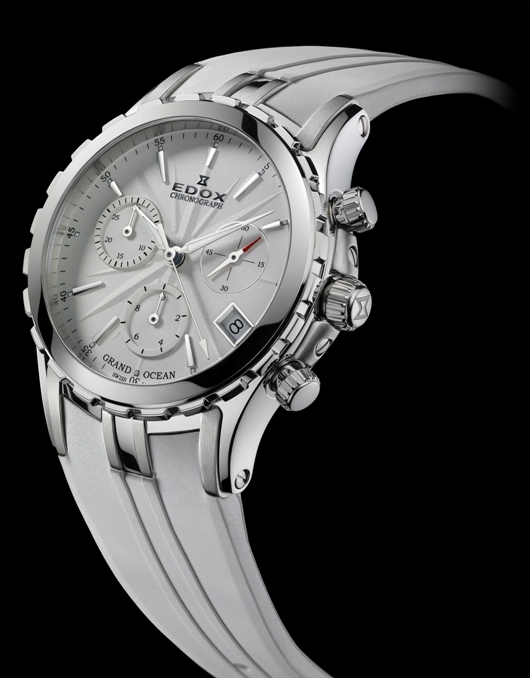 Edox introduced at Baselworld 2011 several exciting new chronographs that further extend its already impressive array of luxury timepieces, which are loved by watch collectors and watch enthusiasts world over.